We now have fewer places to hide. 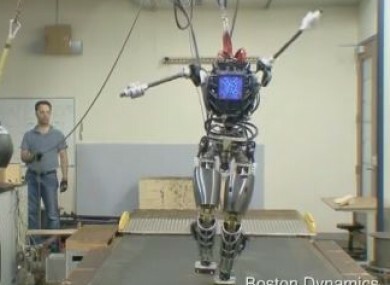 BOSTON DYNAMICS, THE robotics company Google (now under the umbrella that is Alphabet) bought back in 2013, has been making steady progress with its robots. Of the many robots it’s testing, there’s one called Spot which can regain its balance after it has been kicked or shoved, while the latest updates comes from its six-foot humanoid robot Atlas. Now Spot is able to open doors thanks to a new limb and Atlas is becoming more human-like. The demo shows Atlas walking on rocky terrain, keeping its balance after being hit by an object and walking through the woods without a care in the world. Boston Dynamics’ founder Marc Raibert talked about how the focus was on “balance and dynamics”, mirroring the way humans and animals walk. The robot is still tethered to a power source (for now), but it manages to wander down a woodland path without too much trouble. “I’m not saying it can do everything you can do, but you can imagine if we keep pushing, we’ll get there”, says Raibert. You can imagine they’ll get there sooner rather than later. Email “WATCH: A terrifying humanoid robot strolling through the woods”. Feedback on “WATCH: A terrifying humanoid robot strolling through the woods”.